Champion Tails Stain Remover was developed especially to break down urine stains and any complex dirt stains. 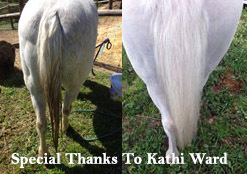 This pony’s tail has been washed using the Champion Tails Ready Mix Stain Remover. So easy to use, just spray onto the tail, leave for a few minutes lather and then rinse off. Condition well with Champion Tails Silver Highlight Conditioner. 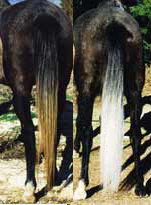 The horse here had bad stains for many years and was washed using the Champion Tails Silver Highlight Powder Stain Remover. Make sure you dissolve it well in very hot water then add to your bucket.